Octagon Houses were a building fad from about 1848 to 1865, promoted primarily by a visionary and architect named Orson Squire Fowler, whose book, "The Octagon House: A Home For All", promoted the benefits of the octagon shape. But he was also a well-known lecturer on phrenology, the "science" of interpreting the bumps on your head. So you'll have to take his status as a visionary with a grain of salt. Most existent octagon shaped houses were flat-roofed; the example we have in Irvington is one of the few domed examples as well as one of the most ornate. The dome and the elegant wraparound porch were added in the 1870's. Also, most of the remaining such houses around the country are owned by historical societies and serve as museums. Vicki and I have walked by the Irvington house many times over the years, as it's located right along the Croton Aqueduct, a popular local footpath. 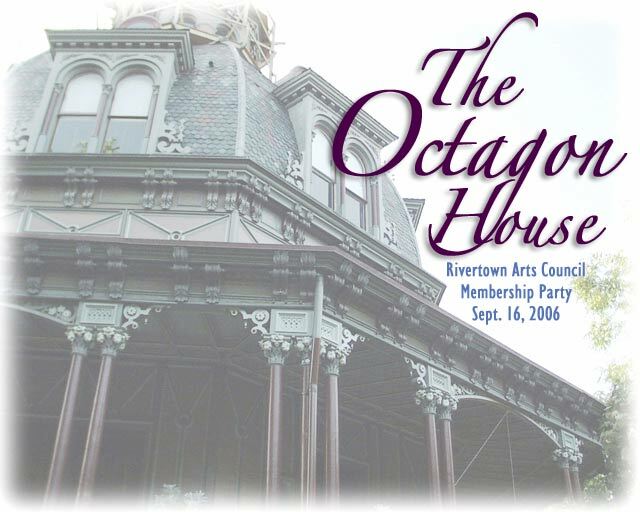 So we were thrilled to hear that the Rivertowns Arts Council was sponsoring a membership party that would allow us to roam the grounds, relax on the porch and peek in the wide-open windows and doors to admire the beautiful detailing throughout the building. We hope you enjoy the experience of this interactive tour as much as we did creating it.